Try an online Crossword Puzzle to see how much you know about Detoxification. All clues in this Crossword Puzzle come from the videos on this page. A printable version of this puzzle and the Answer Key is at the bottom of this page. Toxins such as heavy metals, smoke, exhaust, dirt, airborne pollutants, medications and countless other unnatural agents enter your body through the nose, mouth, skin, eyes, and ears. And while the body’s natural detoxification mechanisms can safely remove many of these toxins, they often cannot eliminate all of them. Over the years, these foreign particles unsuspectingly enter the body and gradually collect within healthy cells. Eventually they reach a level that simply overpowers the body’s ability to properly expel them, and as a result, the negative effects begin to show. Some of the most telltale indicators of toxic status include unexplainable fatigue, skin problems, mood variability, irregularity and constipation, allergies, low-grade fevers, difficulty concentrating, physical discomforts, and sleep disturbances. 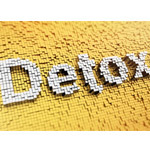 Natural detoxification is a safe and simple process that can involve the use of foods, beverages, herbs and nutritional support supplements to help flush toxins from the body. The liver’s job is to act as a filter for every compound that enters the human body, be it voluntary or involuntary. Over time, toxins and other potentially harmful particles collect in the liver, making it increasingly difficult to eliminate what needs to be eliminated. The use of Milk Thistle extract dates back to the Middle Ages and has been used for centuries to cleanse and fortify the liver. Silymarin (Silybum marianum), also known as Milk Thistle, is an herb that is well-documented in early traditional herbal medicine. Studies abroad and in the U.S. have indicated that constituents in Silymarin may help to support healthy liver function. Every bit of food and drink that we consume must pass through our small and large intestines. This would be simple if every bite of food we took came from healthy, natural sources. But as we all know, this is not likely the case. Most diets are far from perfect, and this can lead to challenges in eliminating waste. As a result, undigested foods, fat, bacteria, and medications end up making their home in the digestive tract. There are a number of supporting nutrients that can be helpful in cleansing built up waste from the digestive tract; they include Psyllium, acidophilus, digestive enzymes, cascara sagrada, senna, and fennel seed. Toxic metals, such as mercury, arsenic, cadmium, lead, and tin, present an unusually significant threat to the body’s natural defenses. Because they hide in the air we breathe, the water we drink the foods & beverages we consume, as well as cosmetic and chemical products we use. As a result, these metals they accumulate within the fatty tissues that make up the brain and liver, as well as the lymphatic and circulatory systems. Things like Modified Citrus Pectin serve as a safe and effective way to help eliminate low levels of common environmental heavy metals. Modified Citrus Pectin can bind to and facilitate excretion of low levels of heavy metals that commonly come from mild environmental exposure. A recent study indicates that modified citrus pectin promotes healthy urinary excretion of common, mild environmental exposures of heavy metals such as mercury, arsenic, cadmium, lead and tin without altering excretion of other nutritional minerals, including calcium, magnesium, iron, copper and selenium. In addition, Modified Citrus Pectin has been shown to support healthy cellular growth and reproduction. Contrary to what some might think, foreign toxins that find their way into the bloodstream don’t just swim around and keep to themselves. What they actually do is attack healthy cells, ultimately interfering with the body’s ability to function properly. Antioxidants, such as Alpha Lipoic Acid, Selenium, GliSoDin®, and Vitamin C, as well as compounds, such Indole-3 Carbinol, and Active Hexose Correlated Compound (AHCC®) have all been shown to be effective in supporting the body’s natural detoxification and/or cellular support mechanisms.